First “Poetry and Revolution” was convened at Birkbeck College. It provoked. Then last May, “Militant Poetics” was convened again at Birkbeck College. It also provoked. 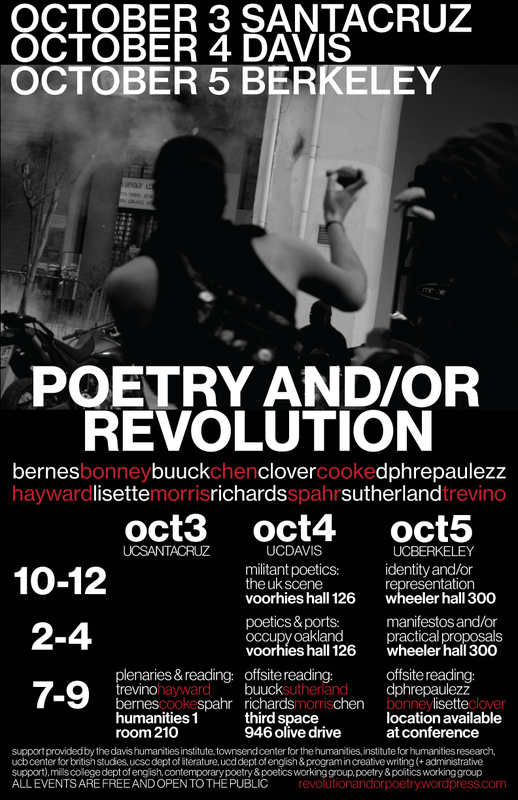 “Poetry and/or Revolution” is a response, an attempt to continue the dialogue. It gathers fourteen poets from the East Bay and the UK. It meets in three locations: Santa Cruz, Davis, and Oakland. Each day will have talks. Each evening will have readings which will then transition into late night discussions, we hope. There might be some dancing.